We traditionally use the term ‘Gulf Stream’ to denote the strong, horizontal surface ocean current which flows near the coast of the USA, from Florida to North Carolina. This current was first identified near Cape Canaveral in 1513 by Ponce de Leon and his crew. Six years later his former navigator Antonio Alaminos took advantage of the current to accelerate the way back to Europe. Subsequently it was used as the basis for routing shipping of the Armada. The current leaves the coast of America at Cape Hatteras at 35º north and flows out into the open Atlantic at around 5km/h as a narrow jet in total about 50km wide. After it has left the coast the current begins to flicker like a candle with too long a wick. Closed rings of currents form at irregular intervals and detach themselves from the main body of the flow, from there evolving like the low pressure systems in the atmosphere. Unlike atmospheric systems, however, these detached eddies can last for many months. After a further 1500 km the bundled stream begins to break up – this branching is known as the Gulf Stream Extension, and the limb that stretches out to Norway is known as the North Atlantic Current. The somewhat complicated terminology of the various parts can be avoided by use of the general term ‘Gulf Stream System’. As is familiar from weather maps, the Gulf Stream follows a path that lies parallel to lines of constant pressure (geostrophic current). In this case the pressure field is defined by perturbations in the height of the sea surface. These perturbations can be detected to an accuracy of just a few centimetres, using satellite measurements (this method is known as ‘altimetry’). The origins of this current system have long been puzzled over. The very name comes from earlier misunderstandings. An intriguingly simple explanation - also mathematically exact - was first proposed in 1947 by Henry Stommel. The initial forcing comes from the atmosphere: the easterly Trade Winds in the tropics and the Westerlies in the mid-latitudes exerting a rotating force on the ocean below. The second essential factor is the way in which the rotation of the Earth affects the movement of the water, a factor whose influence increases the further toward the poles you go. The picture shows deviations of the current sea surface height from the long-term mean, as measured by satellites. This data can be combined with oceanographic measurements of the temperature and salinity of the upper 1000m of the ocean to produce a snapshot of how the deviations compare to a surface of equal gravitational potential. Currents are forced by the pressure variations caused by these sea surface height anomalies, directed along lines of constant pressure, so the sharper the colour gradient in the picture above, the stronger the local current will be. The white areas show regions where the ocean is shallower than 1000m, so the analysis described is not possible. The Gulf Stream System brings warm tropical water towards Europe, thus giving western and northern Europe its unusually mild climate, as compared to other areas at the same geographical latitude. 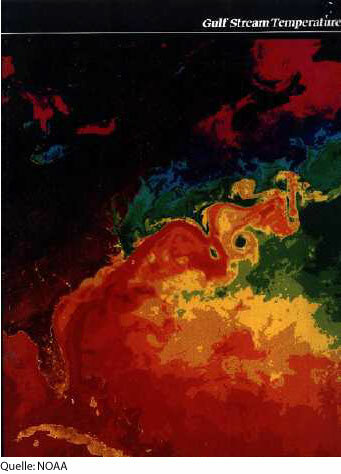 The figure below is from a NASA brochure and shows the surface temperature in the western North Atlantic on a winter’s day, varying from blue, cold regions to the red, warm ones. In recent years another, vertical, aspect of the circulation has attracted scientific and also public interest: the surface water, that flows mainly northward, cools and flows back south to the Southern Ocean at depth. This is schematically, although grossly simplified, depicted in Broecker’s popular picture of the ocean conveyor belt. The northward transport of heat associated with this rather slow overturning circulation is estimated to be a billion megawatts – that’s 300 million kilowatt hours per second! The driving force of this Atlantic ‘thermohaline’ circulation lies at the northern end of the loop. To have a vertical circulation driven by the sinking of cooling water, one requires that the water should become more and more dense the more it cools. Fresh water has a density maximum at 4°C, which means it will become less, not more dense as it cools beyond this temperature. The specific weight of sea water depends on both its temperature and salinity however, and this density maximum is found at lower temperatures as the salinity of the water increases. At a salt content over 21 parts per thousand (the average salinity of the ocean is around 35ppt), this density maximum is at so low a temperature that before the cooling water can reach it, it freezes. For the circulation to work then we must have sufficiently salty water that is able to become sufficiently cold and dense. Tropical water is generally saltier than that found further north, as it has evaporated more, and this is the water that is drawn northward by the Atlantic thermohaline circulation - in the present climate, this mechanism becomes a self sustaining pump - the more strongly deep water is formed, the more salty water is drawn to the north to replace it. Various computer models have shown that an input of fresh water to the areas where deep water is formed in the North Atlantic, like that which would have been associated with the melting of the continental ice sheets at the end of the last ice age, can freshen the surface water sufficiently that the sinking, and thus the whole thermohaline circulation in the Atlantic, grinds to a halt. This mechanism has been described as the ‘Achilles heel’ of the climate system, and is a point of concern for the future development of our climate. Current global warming increases the atmospheric transport of water vapour from the tropics to the poles, as well as changing the snow balance of Greenland (generally increased snowfall combined with increased melting at the edges), and this could lead to changes in the driving force of the thermohaline circulation. Different climate models however give different sensitivities for the formation of deep water in the Atlantic to global warming – most predict a moderate to severe weakening by the year 2100, which leads to the mitigation of the warming for Europe, or possibly even a slight net cooling. There are also model results that suggest that the circulation could even be brought to a complete stop by a rapid increase in the CO2 content of the atmosphere. The future evolution of the Gulf Stream System is thus still an open question.